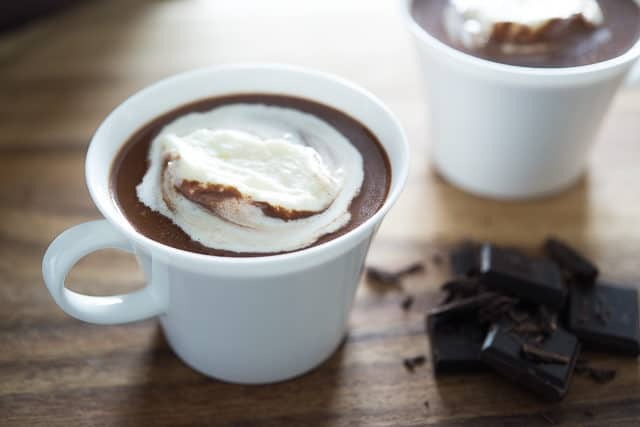 This rich and creamy Hot Chocolate is easy to make, and has intense chocolate flavor. Garnish with whipped cream or marshmallows for a cold weather treat! I’ve tested all the different ways to make hot chocolate and settled on this method as the best. Since I’m not much of a coffee drinker, when I want something hot to drink I usually make tea or hot chocolate. Hot chocolate can be made in many different ways, beginning with either cocoa powder or actual chopped chocolate. Personally, I don’t like the cocoa powder route. It’s nearly impossible to get silky smooth (so many clumps! 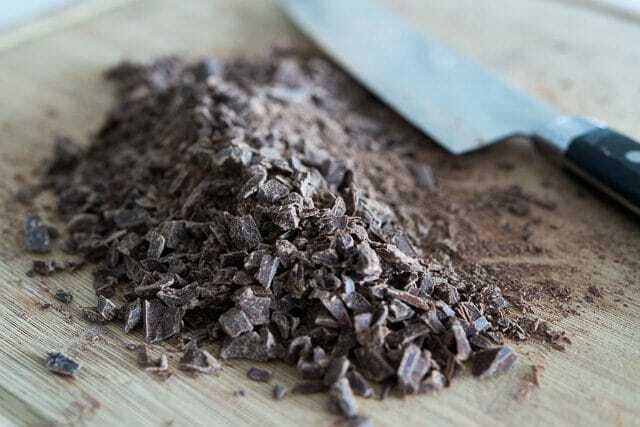 ), and cocoa powder also doesn’t have the cocoa butter content that a chocolate bar has, so it’s not as rich and creamy. The next thing I have played with is how to actually incorporate the chocolate into the milk. 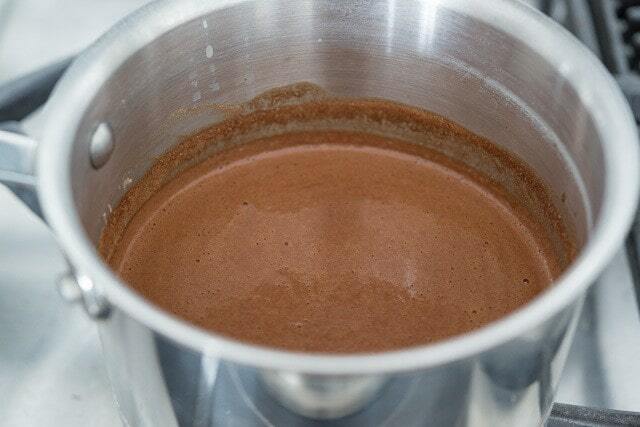 A lot of recipes say to add the chopped chocolate directly into the hot milk, and stir until the chocolate melts. But again, I don’t think the drink ends up smooth enough, because it’s hard to chop the chocolate finely enough that it melts in the hot milk. The chopping is something that has to be done by hand (the food processor doesn’t work well, in my experience), and it’s an annoying enough task as it is. I bring it to a scalding temperature, which is about 180 degrees F.
Be careful to not let the milk come to a boil, or your end result will be grainy. Serve with either homemade marshmallows or whipped cream. For another quick chocolate fix, check out my Actually Good Chocolate Mug Cake. 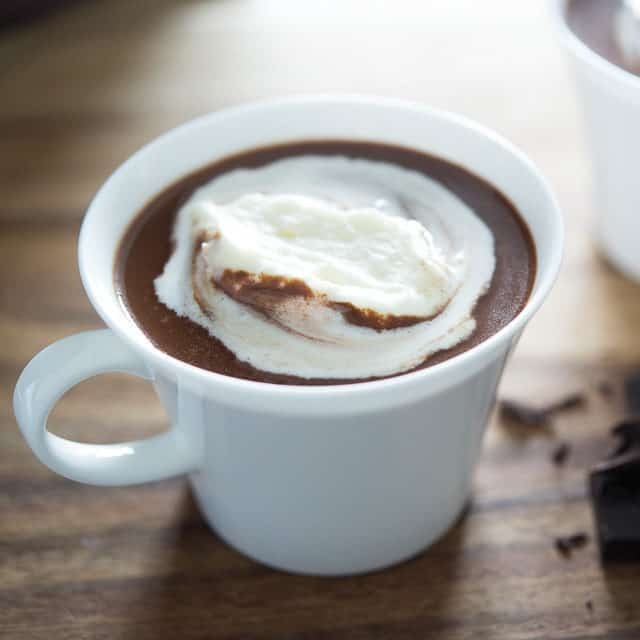 These Chocolate Pots de Creme are also one of my favorite chocolate desserts! Below is a video I made for this recipe, and get the full recipe & instructions below. Can hot chocolate be reheated? Yes, you just need to make sure you don’t bring it to a boil. For that reason, I recommend reheating it on the stovetop until it’s hot and steamy (but not boiling), instead of using the microwave where it’s harder to control the heat. How to store leftover hot chocolate: Let the chocolate cool to room temperature, then refrigerate for up to 3 days. Reheat per instructions above. Hot chocolate vs cocoa: What’s the difference? 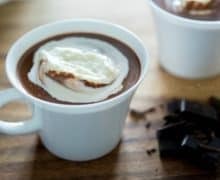 Hot chocolate is made with actual chopped up chocolate (like this recipe), whereas hot cocoa is made from cocoa powder. Hot chocolate is richer. This rich and creamy hot chocolate is super easy to make, and has intense chocolate flavor. Garnish with whipped cream or marshmallows for a cold weather treat! While the milk is heating place the chopped chocolate in the microwave and heat for 30 seconds. Take the chocolate out and stir it. Return to microwave and heat for another thirty seconds, remove and stir. Continue to heat and stir the chocolate in 30 second intervals until just melted. 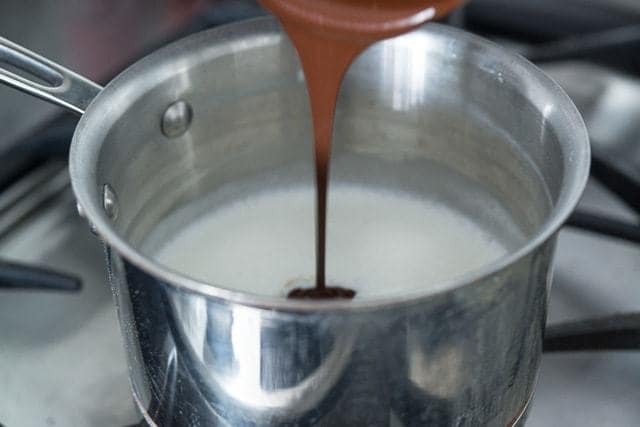 When the milk reaches the scalding point (180 degrees F, with bubbles on the side), turn off the heat and add the melted chocolate, whisking to combine. Add the vanilla extract now, if desired. Top with whipped cream or marshmallows if using, and enjoy! Make sure you don’t overheat the milk. 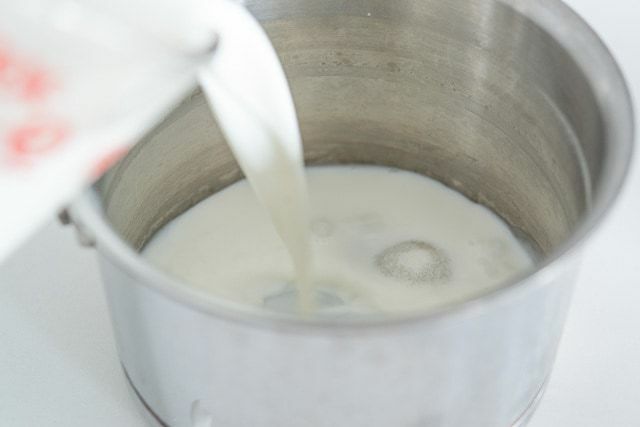 You want it to just have bubbles on the sides, about 180 degrees F. You do not want the milk to boil. 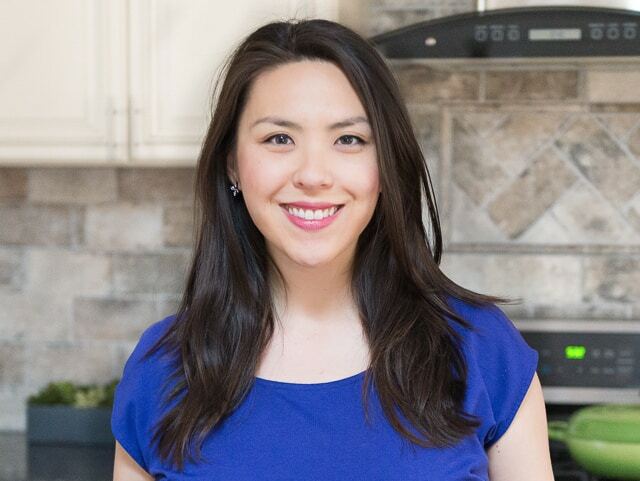 *If you use a sweeter chocolate such as semisweet or milk chocolate, you may want to reduce or eliminate the sugar altogether. You can always sweeten to taste at the end. Post updated in November 2018. Originally published January 2015. Yummy!! Perfect hot chocolate. Awesome instructions. This was good, but I rarely have chocolate on hand, although I always have cocoa powder around. I’ve been making hot chocolate from scratch for years and have never had clumps. I used 4 oz of semi sweet chocolate chips and that may have messed it up. It was so chocolatey!